i see the work that i'm doing as an opportunity to bring people closer and experience a new quality of intimacy - deep human level connection, where we remember one another....i'm really clear that it's the best i can do right now to make the best impact. to me the strength and the specific flavor of this time (in a very broad global, collective sense) is recognizing who and what we need and going after it. bringing it into being. surrounding ourselves with people, environments, and actions that continuously inspire and renew us into a place of potential and possibilities where our passions and callings can be heard, responded to, and followed. we need community for that. we need support. we need to feel understood. we need to be seen and acknowledged. we need to be alighned with others who have similar dreams, goals, aspirations, intentions, motivations, desires, needs, wants, wishes, fantasies, etc. we need to let go of our past of feeling isolated, of feeling lonely. we need to stand tall together in our aloneness, in our personal power, in our collective power, swimming in the pool of what is with our eyes wide open and our hearts at rest. i'm particularly humored by how great it feels to need these things and by the amount of personal growth and development that has evolved from my learning not to depend on these things. i'm specifically thinking about the need to feel understood and seen and acknowledged. i have/am enjoying a remarkable journey of undoing my tendency to define myself and my personal worth by how seen and understood i feel. and i am so in love with the unfolding flowering of being seen and understood. what do you call such delicious entanglements? thank you to my easily amazed family. you do all know how much you mean to me, right? wether you comment or not, i love the life that you breathe into this 'community'. it's still snowing in september! another beautiful snowflake has been added to the collection. free time has found me surfing the blogoshpere. i feel so fortunate to have access to the wisdom, the curiosity, the vulnerability, the rich sharing that spreads through this inner-net. here are some words from a few neighbors that have moved me this morning. Over the years, countless Haitians have asked me, "Why do Haitians have to suffer so?" "Is God punishing us?" #2. Is it corrupt leaders and the abuse of power at virtually every level of Haitian society? #3. Is it discrimination and exploitation from non-Haitians, past and present? his exploration of these questions invites my heart to sit silently in an open, bleeding place, feeling what is. siona's openness and vulnerable authenticity encourage me to accept life as is. The erosion of our efforts is not quite the same as the rich death of a rotted-out, moss-covered pine, and not quite as obviously positive as the life that struggles up from naturally decayed matter, but it is evidence nonetheless of change, of the cyclical force of nature, of the power of the land, and of the laughable grandiosity of humans. We can do what we want. We can construct what we wish. We can tunnel and scrape and pave and shape and build. connecting what we have and do to what we want and need. individuals helping individuals help individuals. • What is happening in your neighborhood, your school, and the larger world? • What should be happening? • How could the most important issues be addressed or resolved? • What do you want the solution to look and sound and feel like? • What is your own dream project? • Who are you and what do you already have going for you? • Who do you know? Where are you connected? • What gifts, talents, passions, skills and experiences do you bring to this? • Are you spending your own time and money on making something happen? • Do you have the funding and need people to work with? • Who's already supporting this project? • Who can we contact, as references, to find out more about the good work you've already been doing? • What would it take for you to make a difference? • Are you looking for partners? • A place to meet? • Some special sort of expertise? • What kind of connections and contributions do you need to give your own gifts, and make your own contribution, more fully? • What kind of support do you need for this project? • What will you do if you get the help you need? • What are your immediate next steps? • What results will you produce? • Where will you report your progress and success stories? • How will all of this benefit you, your contributors and the situation and people you are wanting to serve? • What can you promise to this project and anyone else who will join you in it? Individual action is about making small changes that one or a few people can get started on their own. so go get started, visit the sCNN. patti and i were talking today about some of the differences between working with children and adults. both of us believe whole heartedly in following a child's attention, being guided by the child, slipping into the child's rhythm, aiming to experience as much of the child's world as possible. patti stated: "with children, i'm used to simply riding their waves." as she said this i noticed that children's waves usually fall along the most direct path that the child knows of that leads towards their perception of health. children are quite genuine, even if they are genuinely lying or misbehaving. there is innocence in the child's decision to act in the only way that seems to provide that which the child needs. and moving towards that which one needs is a prominent aspect of healing. i admire the clarity and authenticity of many children's waves and am often baffled by the cloudiness of our twisted and contracted adult waves. i believe that each individual has an intrinsic desire to heal, to move towards wholeness and optimal health. however, i notice that many adults often get stuck treading in stagnant water, water defined by what they should or should not do (myself included). i watch as people make choices that perpetuate their pain and suffering. where i notice a striking difference between children and adults is that children are innocently acting in the only way they know. it appears that adults are often too scared to step into the unknown of being another way. but don't worry, i've far from given up on adults! i continue to live optimistically, trusting in each individuals ability and desire to step onto the path of optimal living, creating a life that is exactly the way one wishes it to be... what do you need to make your life fuller? what do you need to bring more joy and pleasure into your world? what do you need to intensify the feeling of gratitude for this gift we've each been granted called LIFE? another child was quite depressed by the lack of friends and meaningful relationships in his life. he longed for connection. if you're feeling sad, all you have to do to feel better is believe in yourself. do you believe in yourself? what do you need in order to believe in yourself more? what do you need to make your life just a little bit fuller, to feel just a little bit more alive? the ways in which she creates a field of support allowing unseen depths of another to safely rise to the surface. very interesting. when you share stories and emotions from your direct experience you shine as a model of compassionate, open presence. it's who you are! yes, keep tossing us thoughts and links and quotes and pearls--you have a gift at focusing attention in valuable directions. but i want to see your writing voice deepen into the pure presence you share so freely with those fortunate enough to cross your path, the children you touch, the friends you support, the stranger you inspire, the texan you bewilder. . .
the ways in which she creates a field of support allowing unseen depths of another to safely rise to the surface. it's so funny how unarticulate i am about the things that i 'do'. i so cherish reading these words and feeling that surprise inside of me that says, WOW, YEAH, i guess that i do do that! thanks, thomas for encouraging me and helping these strings of light inside me shine ever-so brighter. i'm going dancing... see you next week! p.s. check out the new flake. check out these slumber pods. 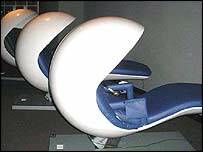 specially adapted chairs fitted with vibration devices designed to make (people) nod off and lights to wake them up at the end of the sleep. "There is a tremendous amount of research that supports the notion that a 20-minute midday nap can rejuvenate people. It improves memory, learning and mood and can boost productivity by up to 30%,"
"At work I realised that people are quite tired at work and falling off their desks or even sneaking off to the toilets to catch rest. Then I realised that we are really missing a comfortable and a convenient place to take a nap during the day," said Mr Chowdhry. Many US companies have created "wellness rooms" for their employees, to allow them to take breaks from the hectic action of their offices or the stock market floor. Mr Chowdhry said several were considering buying pods and installing them in these wellness rooms. what would you like to see (or what already exits) in your "wellness room"? do you have a wellness room at your office? in your house? in the woods behind your house? I would like to welcome everyone to Exploring Counseling, a blog dedicated to exploring counseling from all angles and perspectives - compassionately, consciously, and intentionally. We hope that this will be a place for discussion and discovery, as well as a resource for all. I find it a bit difficult to say exactly what form this will take, but in a way, that is great - it/we will go with the flow and creativity that manifests from our blogging and interaction with anyone interested in issues related to counseling and psychology. i am extremely passionate about the field of therapy and would love to be a part of a community that is working to propagate a holistic, integral perspective of what a therapist and therapy is. there are so many stereotypes about counselors and psychologists that simply are not true and there is a wide population of people who have been let down and disregarded in traditional therapeutic processes. we hope to use this blog to explore and focus on anything and everything that is related to counseling and psychology. an incredibly common and familiar place of frustration and anxiety for many is the unanswered questions of what do i want to do? what are my ambitions? what am i passionate about? where should i invest my energy? thomas directed my attention to this article about eudaemonia, the good life by martin seligman. seligman writes about three kinds of a happy lives. the pleasant life, which consists of having as many of the positive emotions as you can, and learning the skills that amplify them… the smiley, giggly view of happiness... positive emotion. eudaemonia, the good life...knowing what your signature strengths are and recrafting everything you do to use them a much as possible. the pursuit of happiness...the pleasures of contemplation and the pleasures of good conversation...when one has a good conversation, when one contemplates well. When one is in eudaemonia, time stops. You feel completely at home. Self-consciousness is blocked. You're one with the music. the pursuit of meaning... meaning consists in attachment to something bigger than you are. The self is not a very good site for meaning, and the larger the thing that you can credibly attach yourself to, the more meaning you get out of life... joining and serving in things larger than you that you believe in while using your highest strengths is a recipe for meaning. anyone seeking to answer those initial questions, seeking to keep their life nourishing and fullfilling, seeking to invest their energy in the most fruitful places, is wise to practice eudaemonia. it's amazing how deeply connecting with our signature strengths has the power to stop time, liberate us from self-consciousness, empower us to feel at home, enchant us into becoming one with the music, inviting us to continuously flow, flow, flow. seligman's website, authentichappiness.com, offers many questionaires and resourses to discovering your signature strengths and realizing your potential for lasting fulfillment. if you visit the site and take any of the tests, be sure to let us know what you think. p.s. paul, notice what's in your hands. aren't we all just so cute!! you HAVE to go and play at this website. make-a-flake, cut out your very own snowflake. be sure to turn your sound on and create away!! if you get ambitious, mail me a copy of your flake and i'll post it... isn't that pertty! i'm slowly creeping back into the rhythm of blogging... bear with me, please! out. I waited a while but it was too long appearing and I was impatient. forget my horror when I saw how its wings were folded back and crumpled. The wretched butterfly tried with its whole trembling body to unfold them. and, a few seconds later, died in the palm of my hand. confidently obey the eternal rhythm. butterfly could always flutter before me to show me the way. wishing each of us patience in opening our cacoons, spreading our wings, and listening to the eternal rhythm. what flavor does your gradual growth have right now? Patience. Never had much. Yes, I could be focused, centered -- right there. . . but patient? Never! Shortly to experience my 70th year, maybe I should learn? Yesteday I was out on the Maine Coast. Passed through something called The Basin. 200-300 acres of tidal lake.The entry way is about 30' wide. When the tide comes in (or out) there is a wall of water about 4 foot tall -- spilling, frothing, churning. Going in (or out) on a boat can be an interesting experience. Engine screaming and you are going backwards. Patience! And when you look at the rocks on either side(very close@$!!!)Anyhow. The rocks are smooth -- gorgeous. A thousand years' of tidal passage. At the very least. I picked up something that Ashley wrote on IN and then followed of here. I'm glad I did. Boy, do I want to hurry and get "there". JUst relaxing and appreciating where I am seems like a great idea. Thanks for the reminder. and smooth and gorgeous on either side. and christian, thank you for listening to the reminders... funny how they just float on the wind sometimes (or in the tide or on the internet!!). glad to see you both here.